Having lost our ‘friendly’ match I start out on the play for Game One, and play a Forest. Sam drops a Terramorphic Expanse, then fetches for a Forest of her own before passing. The turn following, I play a Mountain and pass, while Sam gets on the board first with an Island into a Sage Owl. Not to be outdone, I do some library games of my own after casting a Borderland Ranger, fetching a Forest. Sam lays an Island and swings with the Owl, pecking me for 1. Turn 4, and all I have to play is another Mountain, but at least I have a body to beat with, sending in the Ranger for 2. 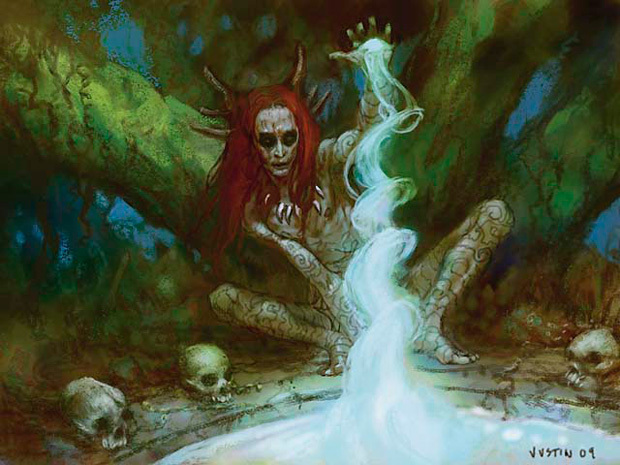 Sam untaps, draws, and plays a Merfolk Wayfinder, and she hits the mother lode: of the three cards revealed, two were Islands, and the third was a Forest that is put on the bottom of her library. She flaps in again with the Owl, then passes turn. On the next turn, I make a stupid misplay, not noticing (and forgetting) that Tuktuk Grunts have Haste, so I swing in with the Ranger before casting them. Whoops! I pray it doesn’t come back to haunt me, and pass. Sam thickens the middle with a Windrider Eel, then attacks in with both of her flyers for 2. Untapping, I draw a Fireball, and it’s just the thing I need to go in hard. With two bodies in play I cast Overrun, swinging in for 11. Sam chumps her Eel to shave off a couple points of damage, and just like that she’s down to 7. She untaps, draws and lays down an Island and a Territorial Baloth. At the end of her turn I tap one Red and cast Lightning Bolt, targeting her. She’s down to 4, and has no answer for the Fireball that’s coming. Game Two begins with a little more pep, as we each get our early land drops, and I field a turn-2 Oran-Rief Survivalist. Sam opts to go for card advantage, and deploys an Ior Ruin Expedition. The next turn, Sam plays a land- adding a counter to her Quest- and passes, while I get out a Greenweaver Druid and swing for 2 with the Survivalist. Passing to Sam, she casts Harrow, adding to her land count and filling up the Expedition. She sacrifices the Expedition to draw two cards, and one of them is another Expedition! She gingerly plunks that one down as well. For my part, I cast a Borderland Ranger, fetching a rather redundant Forest before swinging in for 3. Although Sam is up on cards, her board position is flimsy, and she hopes that her turn-5 Sage Owl will get things moving in the right direction. I play the Forest I’d fetched with the Ranger, then swing in for 5, brining Sam down to 10. I’m still at 20. The Sage Owl obviously paid off, because Sam casts a Roil Elemental the very next turn, saving her Island to trigger its Landfall ability. She opts to steal my Survivalist, but the seperation anxiety proves too great- I Bolt the Elemental at the end of her turn, bringing me back my precious Ally. For my part, I cast Battlecat and swing in for 6. Sam’s in the tank now, fishing for an answer. She plays an Island and a Turntimber Basilisk. The Island lets her pop the Expedition, drawing two more cards, and she mises a Paralyzing Grasp to put on my Survivalist. I swing in hard anyway without the services of the Survivalist, and Sam opts to trade the Basilisk for the Puma. She’s run out of real estate, though, when I cast Turntimber Ranger, and she scoops. A similar start brings us through the final match, with early land drops, me with a cheap Ally (Highland Berserker), and sam with the Expedition on the board. By turn 3 I’m swinging in for 2, but Sam has a turn-4 answer in the Coral Merfolk. Things are quiet again until turn 5, when Sam plays a Windrider Eel, and- to her despair- I lay down a Kazuul Warlord. Sam breathes easier for a moment when turn 6 brings her a Living Tsunami, but little does she realise that it’s the instrument of her demise. She swings in with the Eel and Merfolk, bringing my life to 14. She’s at 15 from the Berserker’s attacks. I untap, and cast an Oran-Rief Survivalist. Although the Survivalist does nothing for me at the moment, the Warlord’s Ally ability triggers, buffing my forces. I cast Act of Treason on the Tsunami, and swing in for 13 points of damage. Casting a Giant Growth closes the deal. The Adventurers has long had a certain reputation in the house as unusually strong for a preconstructed deck, and nothing I saw here even began to unravel that perception. Although the closer I’ve looked at it the more I’ve seen its flaws, it still remains a high-water-mark for power in a precon. 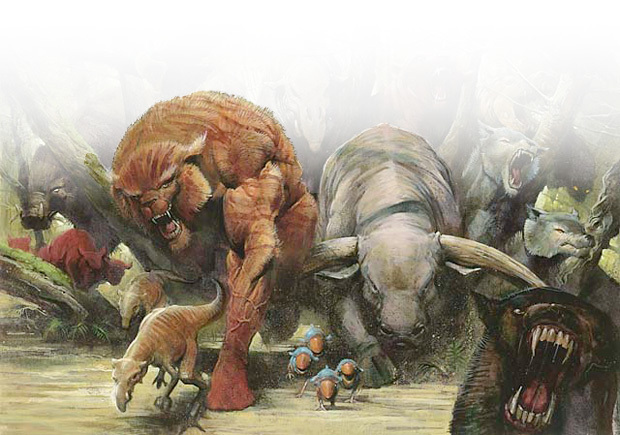 The creature selection is solid, and the Ally mechanic is exceptional at allowing creatures to develop organically over the course of a game, and keep pace with the other creatures that emerge later. It’s a solid and delightfully fun mechanic, one that I hope is revisited in future sets down the road. For those looking to build a fun Ally deck, this is an excellent place to start. 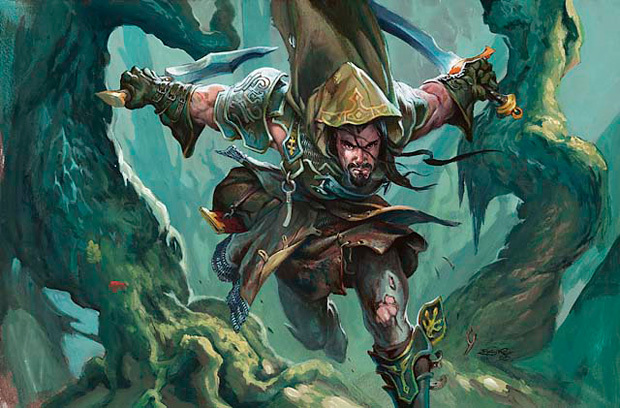 In essence, “bad” cards like the Greenweaver Druid and Borderland Ranger make inviting cuts for the aspiring deckbuilder. jay: do you play these as 41 v 41 card decks or did you flesh them out to make a full 60? my adventurers came today and i’m trying to fill the roster. Hey mate- I left them all 41. Apparently Wizards has released a 60-card version, but because I view them as ‘museum pieces’ I felt compelled to leave them as they were on the shelf. 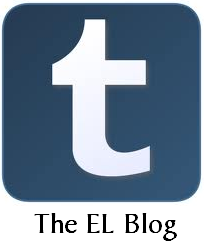 I did think about ‘upgrading’ them to the official list, though. Sorry to reply to an old comment, but are these official 60-card decklists posted online? I’m Courious about their contents. Good question- outside actually logging on to MTGO, I’m not sure where to find those. I tried a quick Google search but came up empty. My fear with playing this type of deck is that it’d quickly stop being fun. Allies get counters. Soldiers just get say a bump from swords or armor. Allies get huge very fast. My Blademaster and Freeblade in my Angel deck normally are well on their way to be angel size before I drop my first angel. I think everyone in my circle would find it far more annoying than entertaining to have a pure blood ally deck. Especially if you run the druid and have ample ramp. Then you could throw in Mind Spring and use taht free mana refill your hand and pop more allies out.